This morning Ming and I had an appointment with the prison chaplain, a beautiful man who is the Anglican priest who, coincidentally, helped enable Anthony’s admission into the nursing home two years ago, and a good friend of my mother’s. While the three of us talked about the improbable possibility of a prison sentence, the prison chaplain must have wondered a bit about the difference between Ming’s reaction to this information (curious) and mine (tears – just a few; I got hold of myself), but he took it all in his stride and spoke calmly and wisely to us. It was a bit terrifying for me to hear about the prison situation, but now I am no longer so afraid, thanks to this wonderful, wonderful man/priest. Ming’s reaction to our meeting took hours to happen. He was calm when he handed in his resume for a job at a restaurant, calm having lunch with me, calm during a Centrelink appointment, calm during a visit to Anthony while I did some errands. Me: So what is your main problem with me at the moment? Ming: Your geese poop on my shed doorstep and your peacocks poop on the car! Me: So you are more upset about the birds than the possibility of prison? We are both fine again now, having sorted a lot of things out and I am so thankful for the fact that he and I can be honest with each other and get over/through these wrangles but it is so exhausting! I think I might need to visit that wonderful priest again – soon. His name is Brian and he is a legend! I saw Anthony this afternoon at the nursing home, and I showed him my blistered, peeling, bleeding hands and feet and told him that I had seen a doctor who had prescribed cortisone cream. The doctor was more fascinated than concerned, when I told him I thought I had ‘pompholyx’. 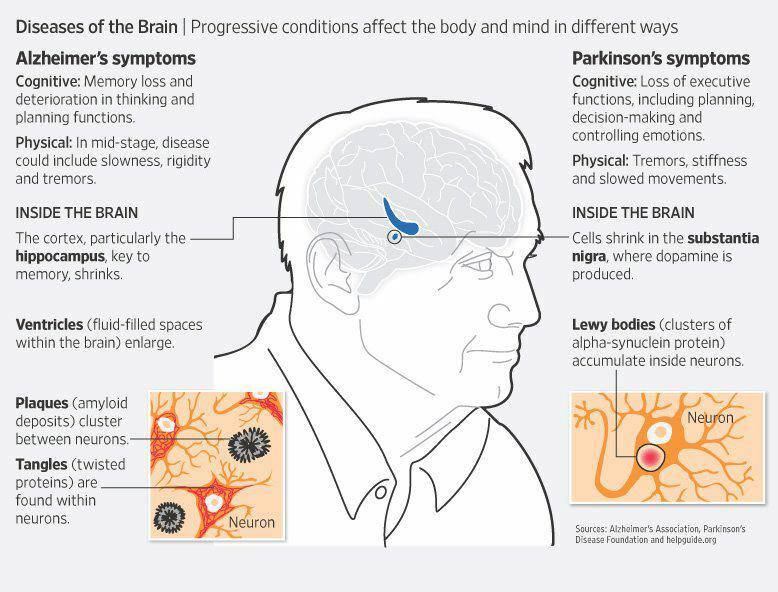 So, while I scratched away at my itchy hands and feet, he looked it up and confirmed my self-diagnosis. 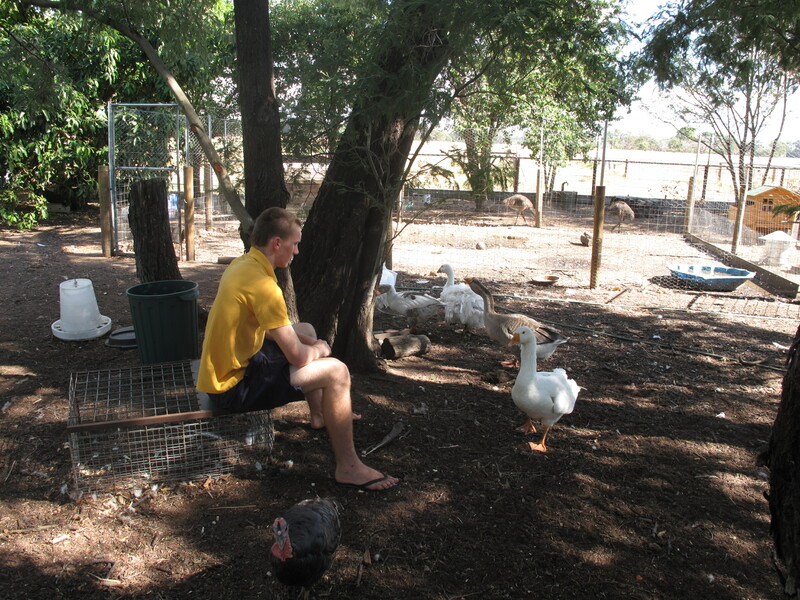 I just wish he hadn’t insisted on looking at my always-dirty-from-the-chook-yard feet – oh well. Anyway, as I was telling Anthony all of this in my usual dramatic way, he pointed to his own hands and said he had the same thing. Well of course he didn’t have the same thing – it was just skin cancers on his old hands but I appreciated his empathy. Anthony: There is a doctor here who knows about it. Anthony: Your hands, this – he has black hair, young guy. Me: Is he the doctor replacing the one on holidays? Anthony: I don’t know, but don’t trust him, Jules. Anthony: He wants all of the Parkinson’s people in an experiment. Me: Oh Ants it’s probably just a student doing a survey – is he asking you questions? Anthony: Yes, personal. Don’t tell him anything, Jules. Me: Ants, do you think you might be imagining or hallucinating some of this? Anthony: I don’t know, maybe – oh and the family came this morning to take this place over. Anthony: Yes – there’s a lot of money – be careful. Me: I’ll check it out if you check out that whole doctor thing. Anthony: One of them has red hair. Me: That’s the priest isn’t it? Anthony: No, the doctor – another one…. Me: I have to go now, Ants but I’ll be back tomorrow. Anthony: Why do you have to go? Me: It’s getting late, I have to get groceries, go to the chemist and look after Mingy. Anthony: But where do you live now? Me: I live at Bythorne, silly, on the farm! Anthony: Do I still have a corner room there? Me: Yes, but I can’t look after you overnight now because you are too heavy. Anthony: But it’s still my farm. Me: Your beautiful, beautiful farm, Ants, and Ming and I are taking care of it. After this conversation, we hugged and kissed and I came home to Anthony’s resounding absence. 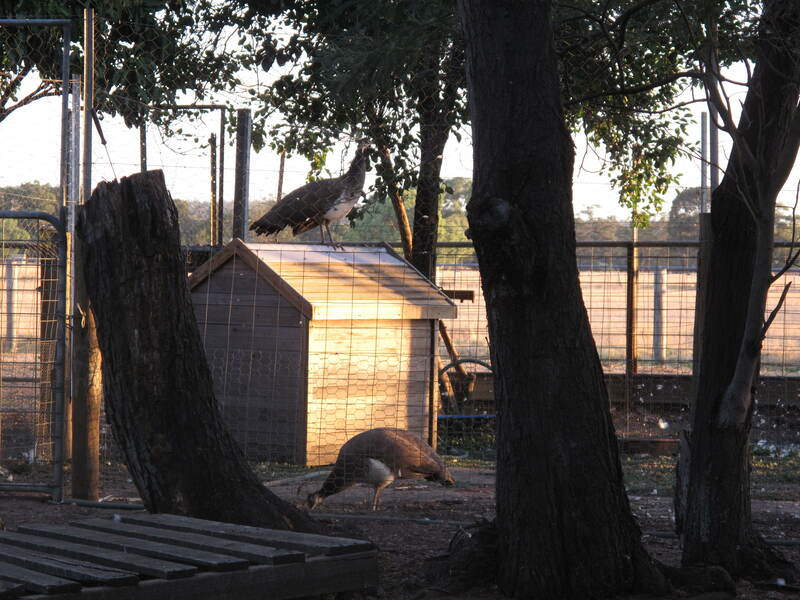 Ever since the peachicks entered our lives, over a week ago, everybird has become very attentive at sundown, including this young couple (the peahen is the second one to finally return although without chicks). 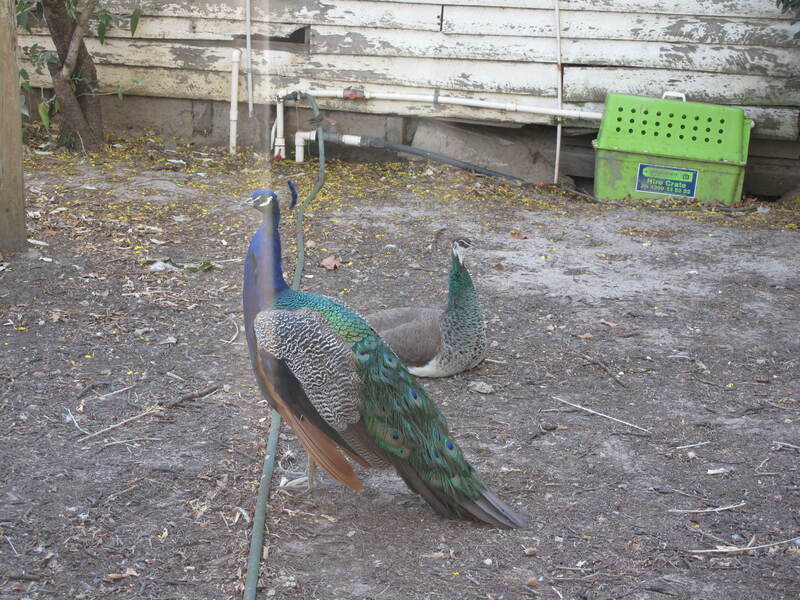 Prince is also quite interested in how Queenie gets the chicks to bed (notice how he has lost all of his long tail feathers – all the peacocks have now). Gutsy9 is a bit jealous and is always right next to me. If I crouch down, she offers her neck to be stroked. While Queenie is stirring the chicks up, preparing them for their bedtime transition to the avocado tree, I put the geese, duck and turkey into their yard for the night. 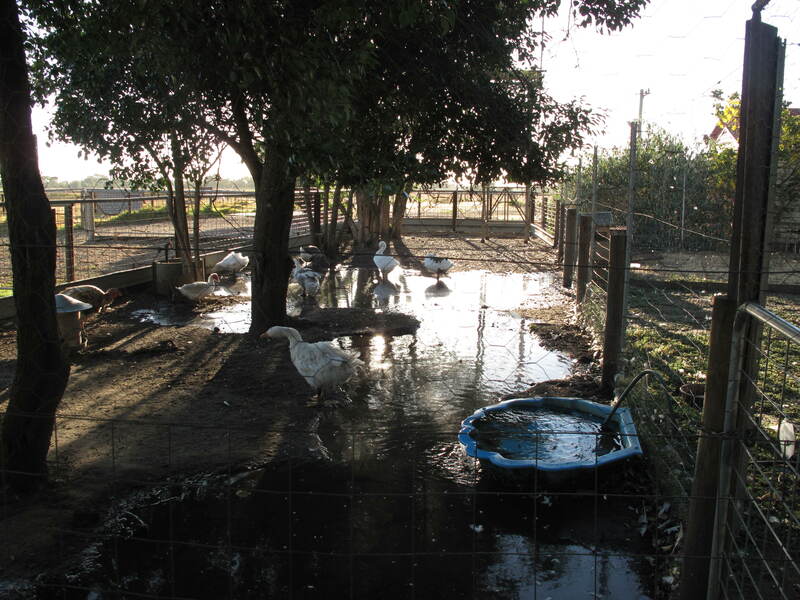 I have been trying to flood their pen in order to create a kind of pond for them and it is working. Queenie and the peachicks take ages to get ready for bed. 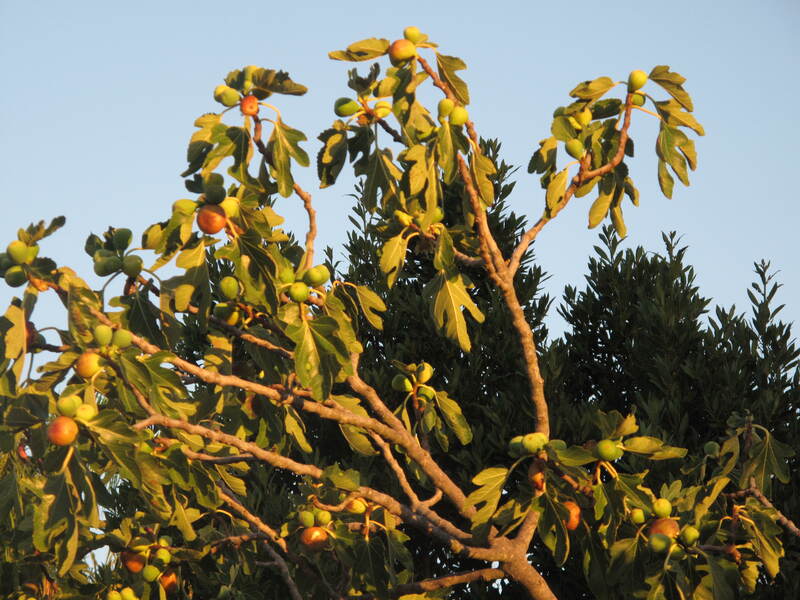 So I take a photo of the fig tree while I wait. 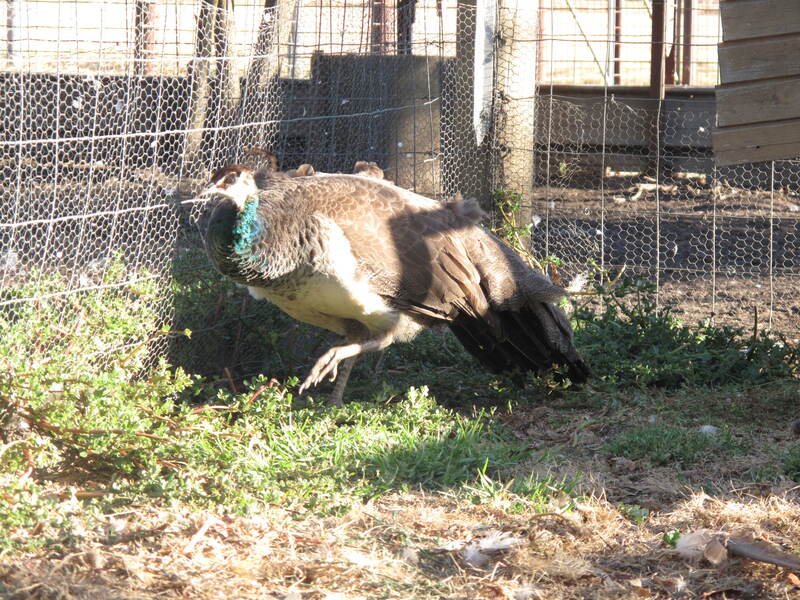 The younger peahen flies into the yard to encourage Queenie. 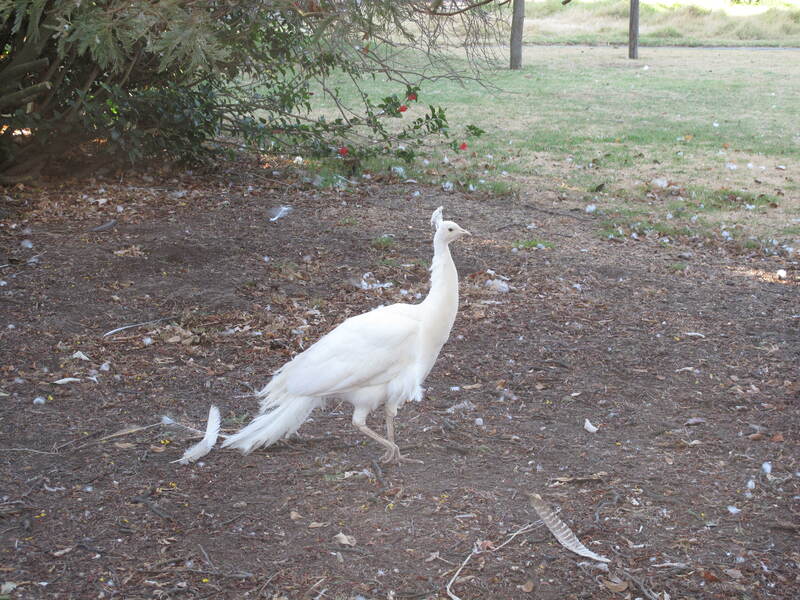 King (undoubtedly the father) also flies into the yard and takes a protective stance. And then the magic begins. The bigger chick actually leads the way! Queenie has to help the smaller chick. But it comes back down again to say goodnight to me. This is around the same time (7.30-8pm) that Anthony often suffers ‘Sundowner syndrome’ so, once I leave the birds and go into the house, I always ring the nursing home to say goodnight to him. As he almost never answers the phone himself I usually have to get the nurse-in-charge to enable a conversation. Lately Ants has been okay, delusional but not upset. He often thinks he is either at boarding school, a hospital, a party, or a pub. 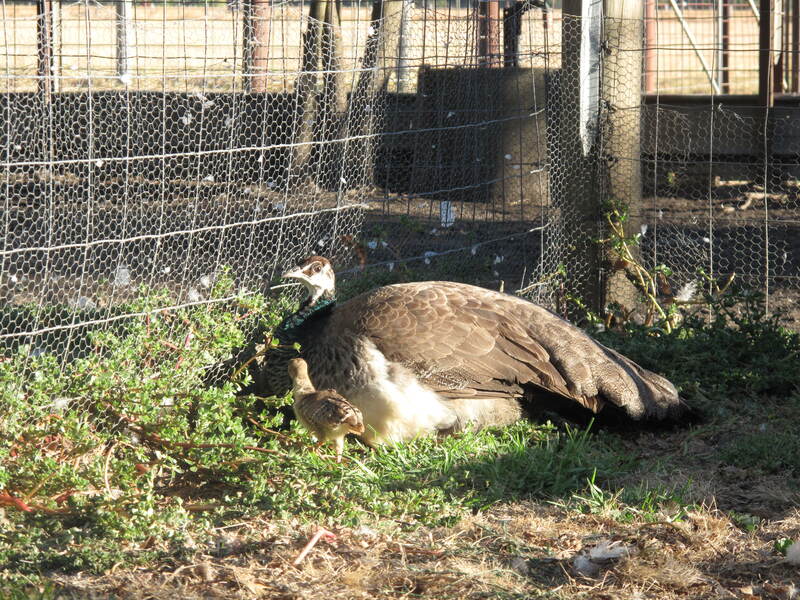 Okay so here is how the Queenie, the peahen, and her two chicks go to bed every night. 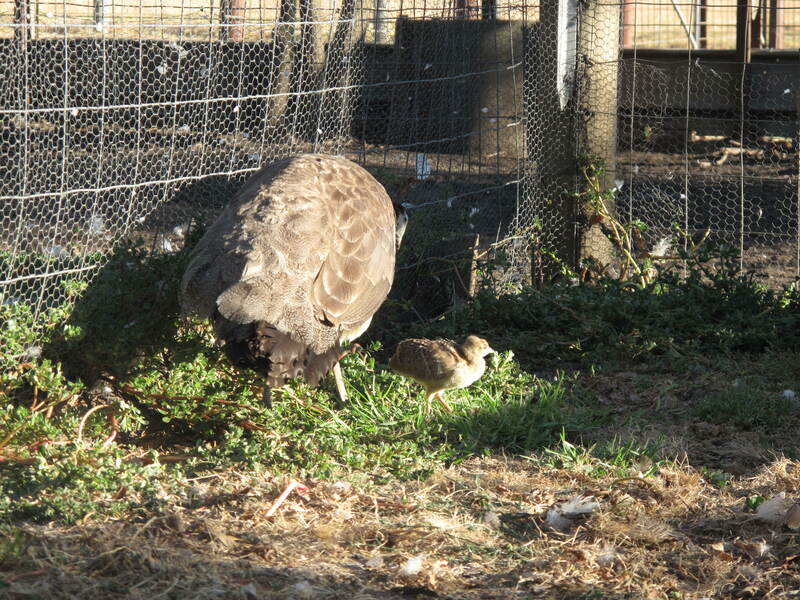 Firstly, she looks around anxiously from the pen (in these photos both peachicks are underneath her). Then she starts to sort of purr at the chicks, almost as if she is saying ‘follow me’. She begins this restless ritual at 6pm. She stirs the chicks up a bit and they begin cheeping loudly. 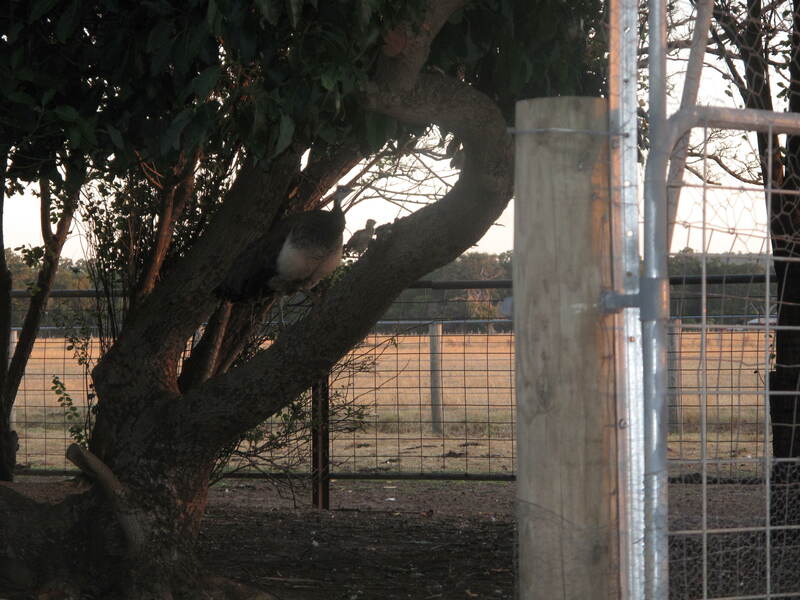 At 6.30pm she flies over the fence into the adjacent yard. This photo is just before she launches herself over and away from the chicks. 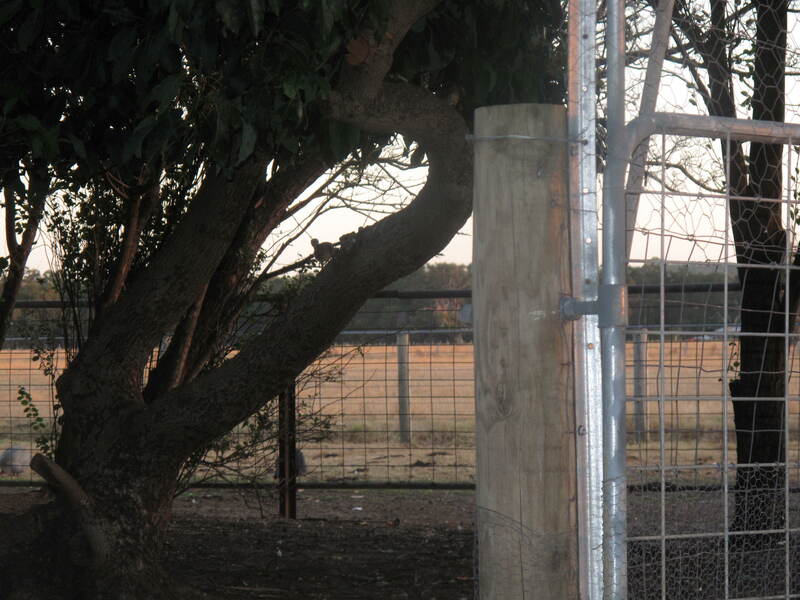 The two peachicks go into panic mode and try repeatedly to fly after her while, from the other side of the fence, Queenie purrs encouragement. Eventually, one by one, they fly/climb the fence until they reach an opening they can fit through and plop onto the ground on the other side. 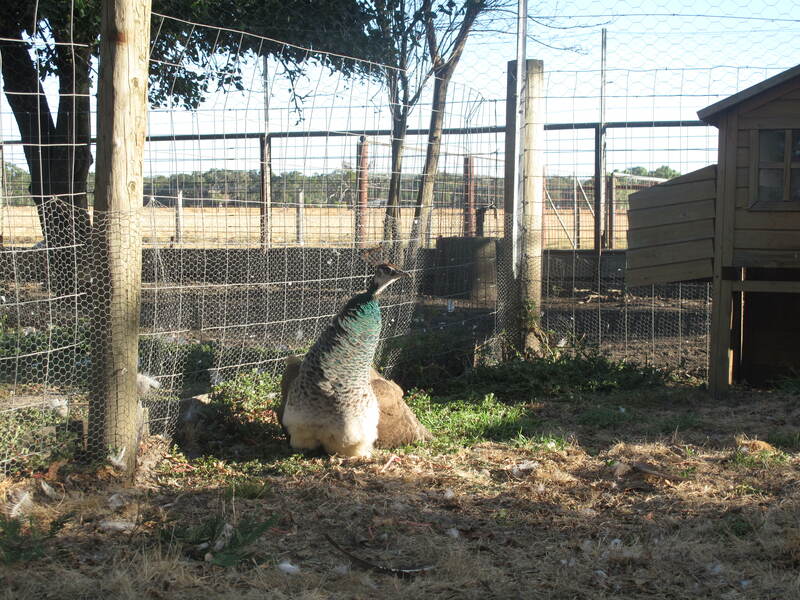 The smaller peachick takes at least fifteen minutes longer than the other one but once it’s through the fence, they all have a bit of a hug. By this time it is 7pm. 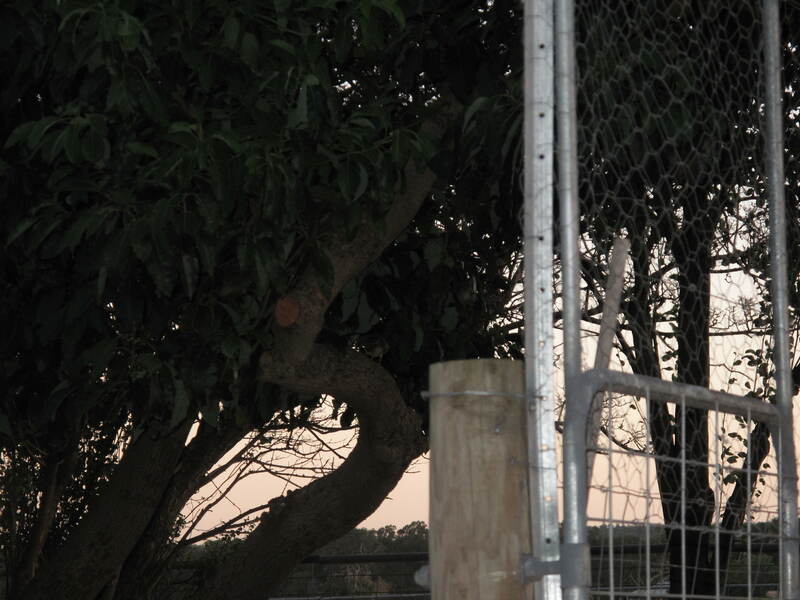 Queenie then flies out of the second pen straight into the avocado tree, then down to the ground to once again beckon the chicks through the second fence. 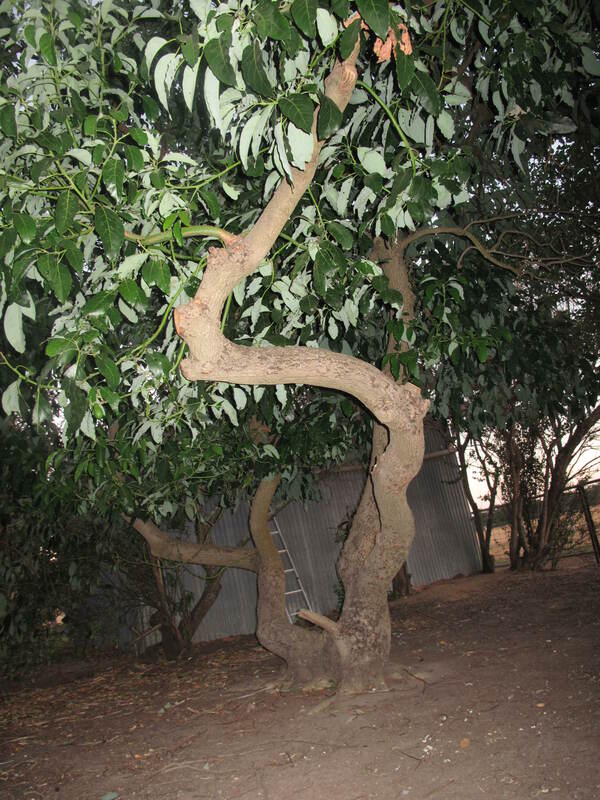 This photo is an old one but it shows the two pens with the avocado tree on the left. It is a long journey for the chicks. 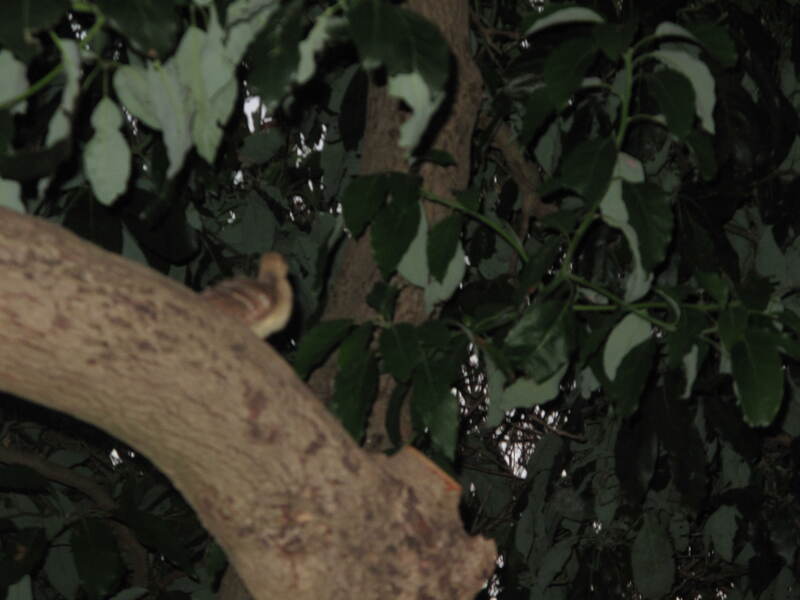 Eventually the chicks get through and arrive at the base of the avocado tree. These two photos don’t include the chicks themselves because they were quickly climbing the trunk to reach their mother. 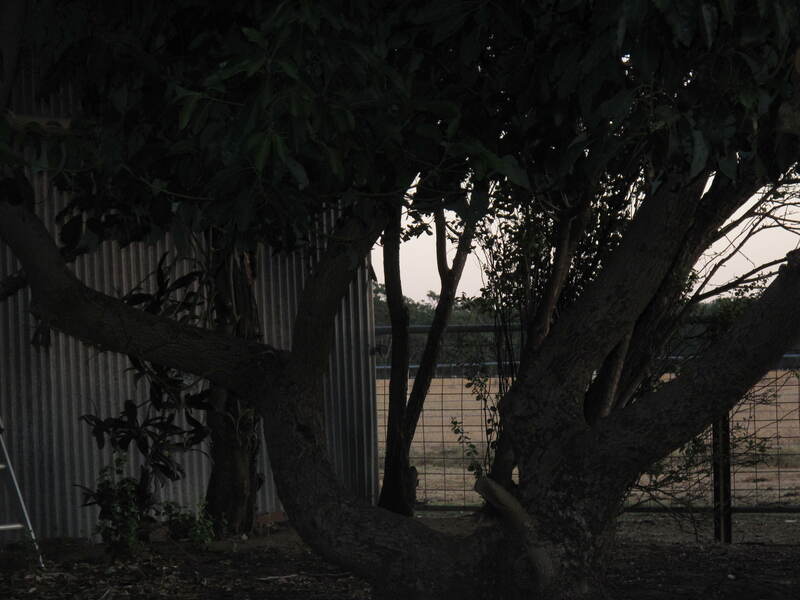 But as you can see it is a well-chosen tree and easier to climb than any of the others. 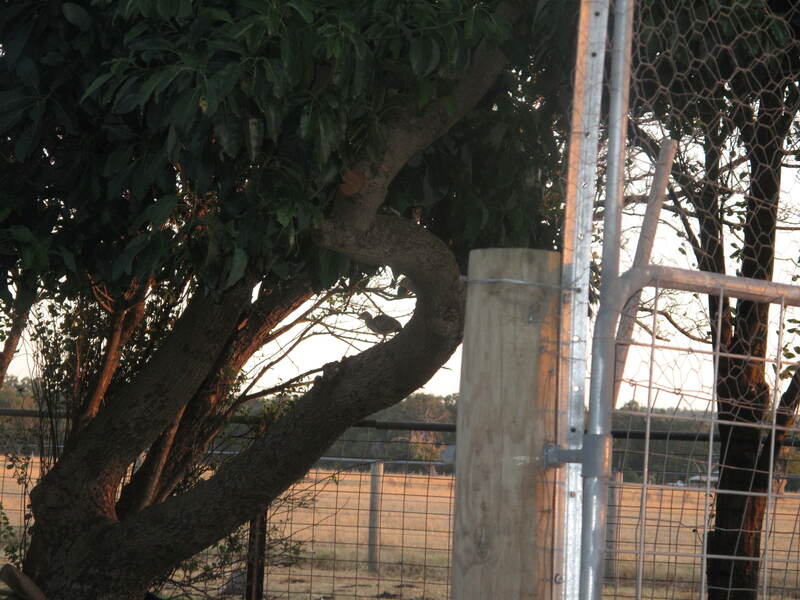 Queenie then flies up to perch in the avocado tree and purrs at the chicks to follow. By this time the chicks are cheeping so loudly that it is almost deafening. 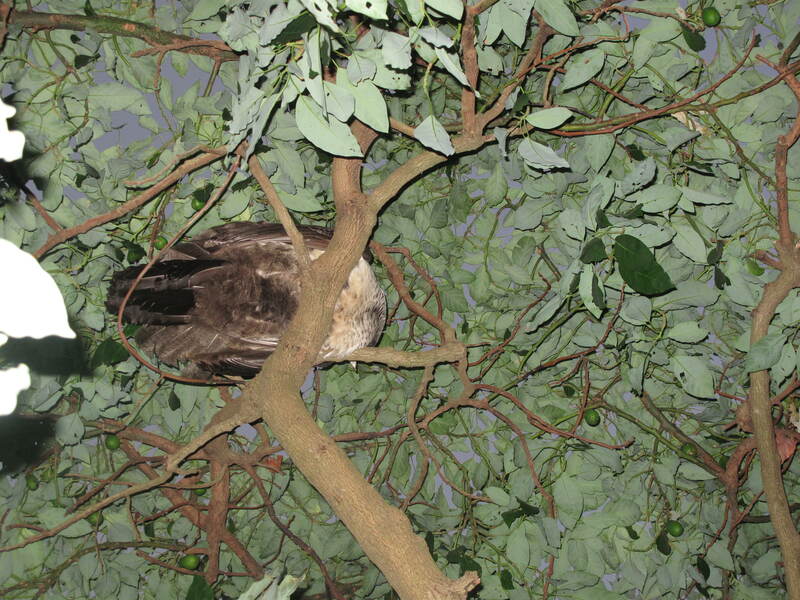 They try repeatedly to fly/climb the tree only to plop down to the ground again and again. 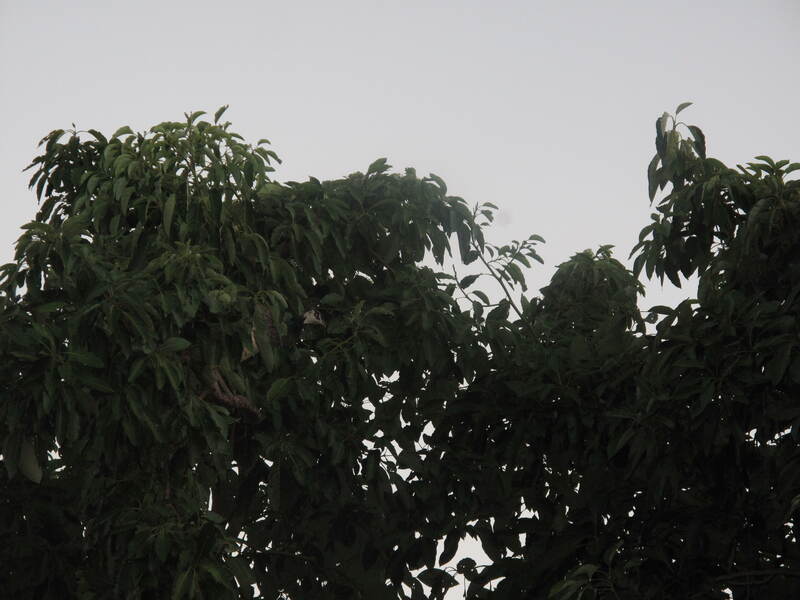 Queenie remains in the tree, purring encouragement, until finally they succeed. It is difficult to spot the chick in the first photo! Finally, all is quiet. 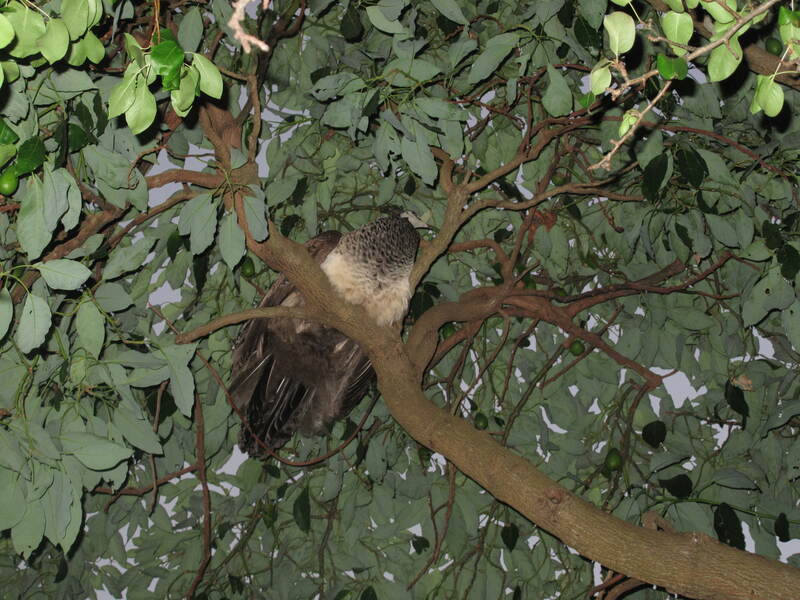 Here is Queenie curled up on her branch with the chicks underneath her wings. It’s 8pm. The most amazing thing about all of this is that each morning they are all back in the safety of the yard again! 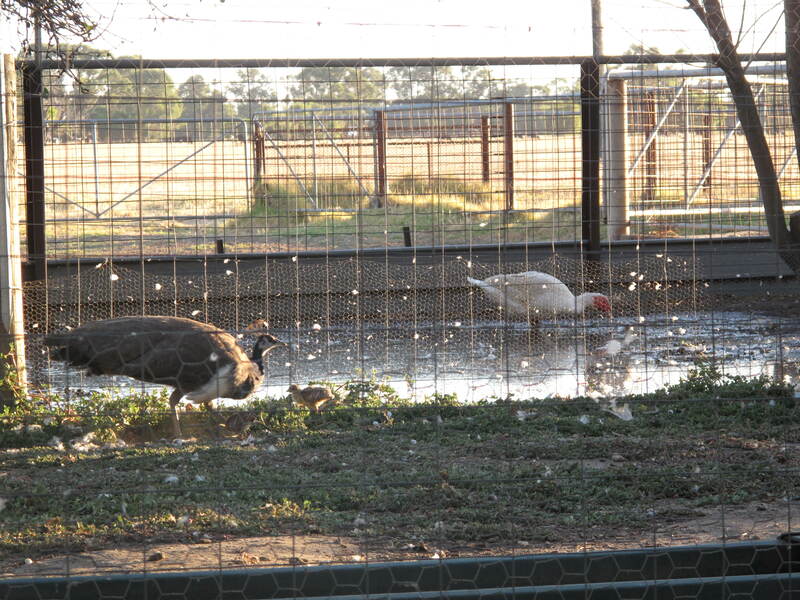 A bit over a week ago I began to hear cheeping every time I went out in the evening to feed, water and put the gang (geese and duck and turkey) into their pens. 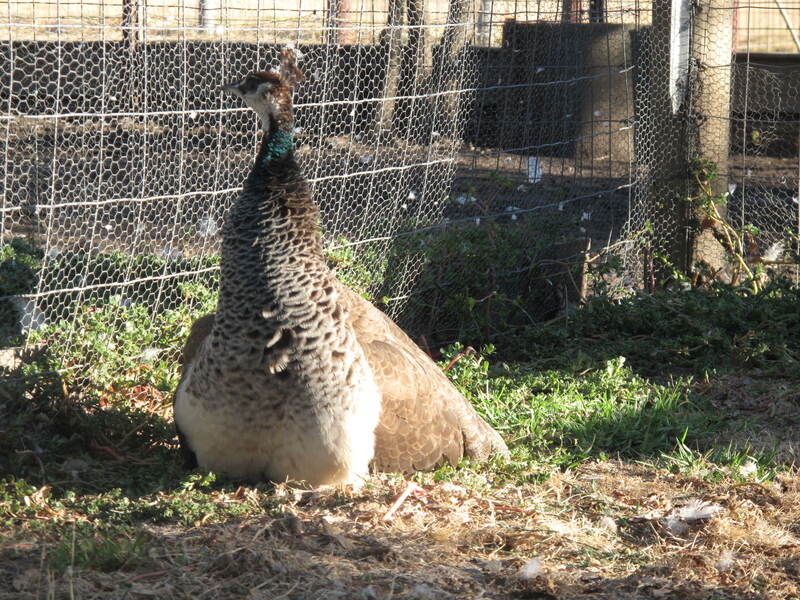 None of the peafowl have ever been penned because our dogs don’t attack them and they fly up into the trees at night to sleep. 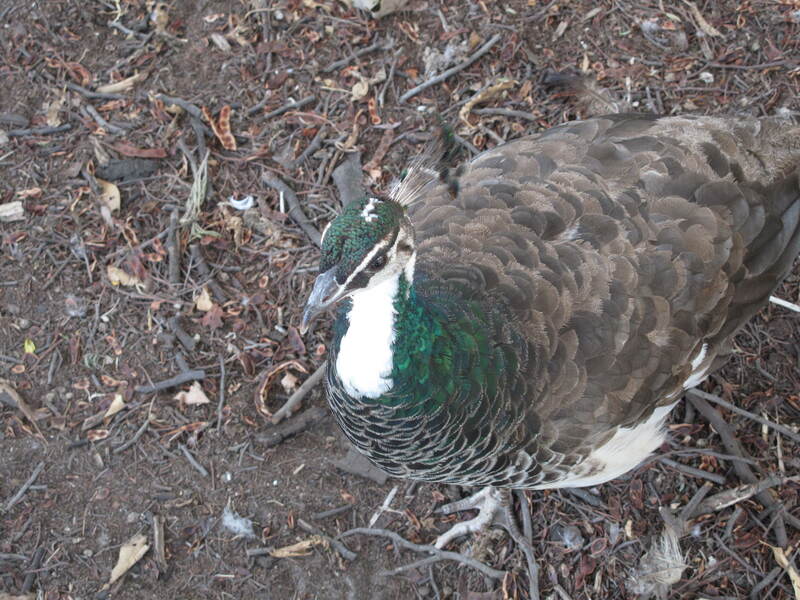 We have five peacocks (one white and the rest blue) – and seven peahens (two white, four green and Gutsy9), but during mating season all except one peahen and G9 disappeared. I assumed they were all nesting somewhere, or trying to, and I hoped for the best that none of them had been killed by wild foxes. 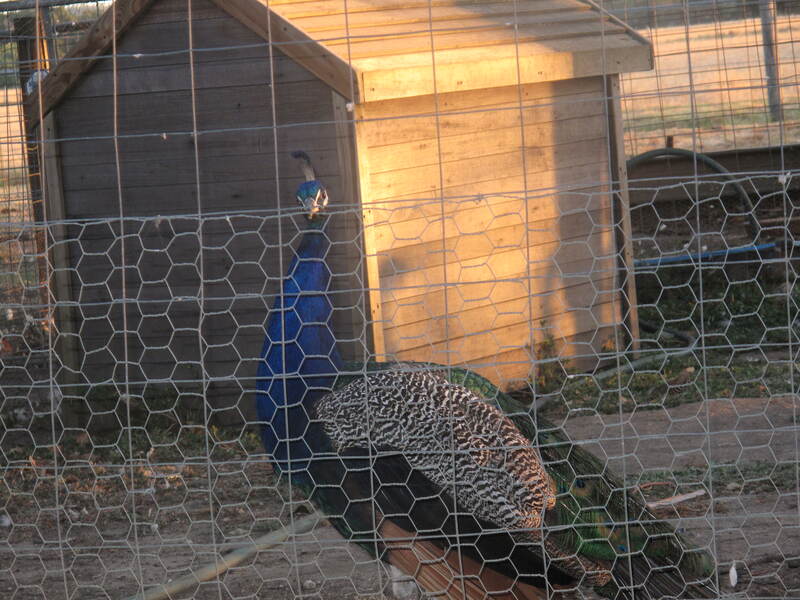 But as the weeks went by I began to lose hope and the peacocks’ cries became more mournful. I didn’t even let myself hope for chicks because, with the crows and foxes, I knew they had little chance of surviving, so I put the cheeping sound down to my imagination and/or the sound of wild bird chicks somewhere. I did a bit of a search every afternoon/evening, but nothing. Then one evening, I saw them! 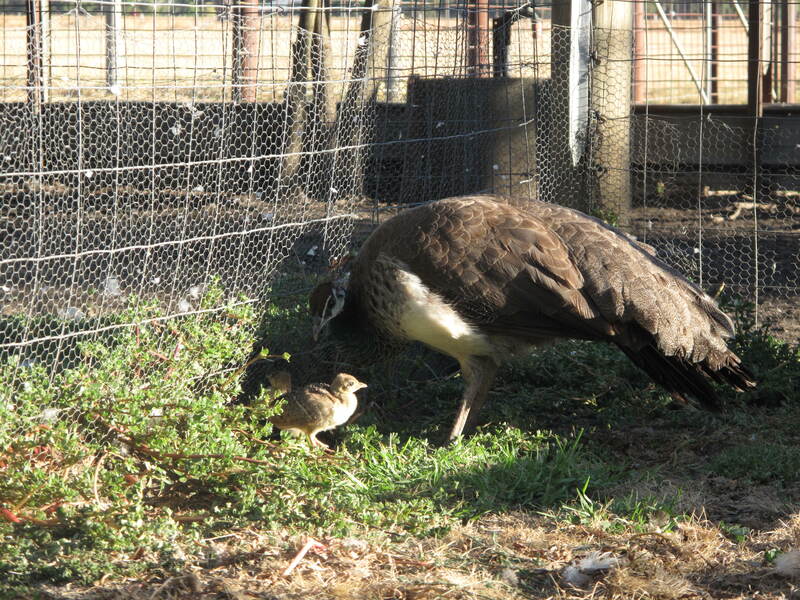 Two chicks with Queenie (our oldest peahen) foraging under a shrub. I was delighted, but decided not to intervene because I could see they were a great little unit, so different from when I found G9 a year ago, obviously abandoned. I didn’t hold much hope for them but for the next couple of evenings they were still around! Our dogs hadn’t detected them, they hadn’t drowned in the pond, and they were surviving without human intervention. 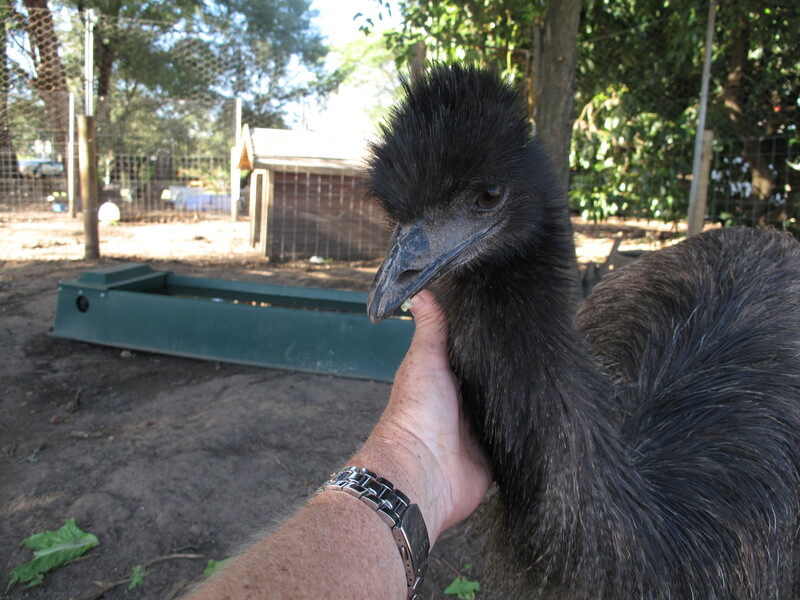 Nevertheless, I knew these tiny creatures were in great danger from predators so a week ago Ming herded Queenie and the chicks into our smallest pen. I put a shallow water bowl in the yard and lots of wheat grain, which is what I feed all of the birds, and, when they were all still there the next morning I breathed a sigh of relief. The bottom of our three animal yards is meshed to prevent foxes getting in so I assumed Queenie and her kids were sleeping there. And maybe they were! But then, the other evening, they weren’t; they were gone! I assumed the worst until they were back in that same pen the next morning. This has been going on now for a few days: Queenie and chicks in pen during daylight; Queenie and chicks gone from pen by 7pm. For better or worse …. When Anthony and I were married, we agreed to the usual vows including ‘for better or worse’. At the time, I was unconcerned that he was 23 years older. He, on the other hand, was very concerned, and worried that I might end up looking after an old man. At the time, we both laughed this off because we didn’t anticipate illness. It seems unfair that my beautiful Anthony was inflicted with kidney cancer, diabetes, liver disease, prostate cancer, then (by far the worst), Parkinson’s disease – all within the first ten years of our marriage. For Ming to never have known this gorgeous, energetic, life-of-the-party person I fell in love with is a bit heartbreaking for me. I can only show Ming photos of when Anthony cuddled him, lifted him over fences to feed calves, taught him how to wash the car, strollered him into the dairy, slept with him crooked inside his shoulder space, toilet-trained him in about two hours when I was away at a conference, loved him with the energy of a new father, rejoiced in every single breath, sound, word, movement that Ming made. Now, with the encroaching dementia that comes with advanced Parkinson’s disease, and Anthony’s deterioration in mobility, his wild hallucinations that he has been kidnapped, his outings with me fraught with bizarre stories of what I know couldn’t possibly have happened (eg. removal of a foetus from Ants), I sometimes cry. Tonight, the nurse enabled a phone-call to Ants and, as soon as I heard his voice (usually it is soft now, but tonight it was loud and confident), my pent up tears broke. Anthony: Jules -please don’t cry! Me: It’s all just so hard, Ants – sorry. Anthony: Jules, it is going to be okay. In sickness and in health …. The term ‘marriage’ implies commitment, loyalty, empathy, forgiveness, flexibility, and the ability to carry on, no matter what. In this sense, I am actually ‘married’ to a lot of people and this makes me feel on top of the world! I wasn’t going to say anything about this for awhile because it is so hard to talk about. Ming and I attended court the other day and his charges were read out, one by one. So, instead of the magistrate saying, “You are charged with five counts of dangerous driving causing bodily harm”, she read the charge five times. I sat at the back of the court room thinking it sounded like he had had five separate accidents. Ming stood next to his lawyer who then asked for an adjournment. This was approved with the next court appearance late in February. I think that is when the barrister will assist Ming in his plea of guilty and help him get a lesser sentence than prison. The fact that prison is a possibility has been pointed out to me by the lawyer, barrister, police and our Anglican priest (who also happens to be the prison chaplain for this area). He – the chaplain – is meeting with us next week to discuss prison implications for Ming and to demystify its terror. Of course this scares the hell out of me because I thought prison was a very remote possibility, but the chaplain has said that the law is quite unpredictable and he wants to prepare Ming and me for a scenario whereby Ming is whisked straight from the courtroom to prison. It is so hard for me to accept that my son, who was only wanting to give the kids a thrill, with parental consent, drove off the property, lost control on gravel, and injured five children. This careful, cautious, non-reckless son did this and I still cannot believe it; it still seems surreal. All five children have recovered physically now, and for this I am so grateful that I cannot put it into coherent words – just a hell of a lot of tears to say thank you for the fact that they are okay. I haven’t been able to properly focus on Ming for many weeks, because I was ashamed of him, and distraught, and so worried about the kids. Now that I know they will be all right, I am re-focussing on Ming and am terrified of course. Praying seems a rather good idea. One of the unexpected bonuses of blogging for me has been the very real friendships formed, the mutual support, the shared humour, the shared grief. The lessons of life that I have learned through other people’s stories, and interactions, have taught me how to better do empathy and sympathy, and forced me to feel the difference. Thanks so much for those of you who have commented, ‘liked’, and given me your friendships. For those of you who are bloggers, I am struggling at the moment to keep up with your writings, so please forgive me for that. For Facebook friends, same thing really! Ming goes to court in three days. Apparently he and I simply appear, his charges will be read out, and the case will be adjourned by our lawyer until the end of February. So I really need to concentrate on all of this at least until the beginning of February, and blogging will go on the back burner for the time being. Hard to believe now that when I began blogging it was all about the birds.